We learned with dismay of another recent serious pedestrian incident in our neighborhood, this one at the intersection of Hyde Park Ave and Arlington Street. As is frequently the case, it appears that poor street design was a contributing (perhaps primary) factor, and excessive speed resulted in more serious injuries. If the city gets serious about Vision Zero, we should see fewer and fewer of these tragedies. Pedestrian injured crossing Hyde Park Ave.
A pedestrian was hit by a car on Saturday, Jan. 19, at approximately 5:45 p.m. Neighbors said when it happened they heard a smash and a scream. They said the ambulance and police showed up to the scene, as well as, the Boston Fire Department. But such an accident is something that neighbors would say is not surprising, considering how fast the cars tend to speed through that intersection. Nijha Middleton, who has been living on that intersection of Hyde Park Avenue and Arlington Street for three years, was home during the time of the accident that night. When she looked out the window, she said she saw a woman lying in the middle of the street, and the girl who witnessed it screamed and called 911 standing on the sidewalk. Then she said she saw police and ambulances attend and family members running to the stricken woman. “It looked really bad,” she said, explaining that the it took the EMTs awhile to put the victim in the ambulance. According to the police report, the pedestrian has no lifethreatening injuries and the investigation is still ongoing. Middleton said that such accidents is likely to happen at that intersection because of the speeding cars, lack of speed limit signs and lights, and having no crossing guard. “People are such in a rush, they never really want to stop, so it makes it difficult to cross the street,” she said. She often walks on that intersection herself and said that almost every other morning she’s scared to cross the street. “Maybe there needs to be a point that they have to put a stopping light, so everyone can stop rushing,” she said. Thank you for reporting on the injury of a pedestrian who was crossing Hyde Park Avenue. This is the 3rd such incident in the past two weeks with two pedestrians killed when struck by dangerous drivers – one in Roslindale and another in Dorchester. It is important to note that these were not accidents, as was reported, for the pedestrians were not accidentally in the cross walks, but crashes in which drivers drove their vehicles recklessly. While the City of Boston has begun an important effort to improve pedestrian safety with the Vision Zero project much work needs to be done. In Roslindale an effort is underway by the citizen group WalkUP Rozzie to get the City to make changes now. For too long our streets have been designed for the benefit of motorists. Simple changes such as speed humps and sidewalk extensions can slow traffic and provide more protection to pedestrians and bicyclists. We enthusiastically support the Rozzie Urban Wild protection campaign, an effort spearheaded by WalkUP members and East Roslindale/Mt. Hope-Canterbury neighborhood residents Lisa Beatman and Rick Yoder. Back in November, the West Roxbury/Roslindale Bulletin highlighted the systemic disregard for Greenbelt protection along American Legion Highway. More recently, the Bulletin ran another piece, detailing the potential for the area to be turned into a vibrant greenspace. Check out both stories, and kudos to Lisa and Rick for keeping the spotlight on this important initiative! 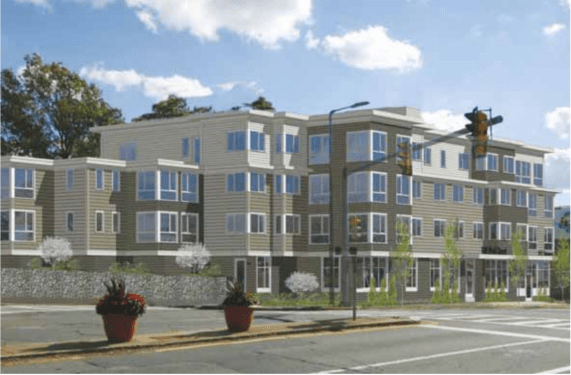 We’ve posted multiple times about the proposed development at 100 Weld Street, which recently won approval from the Boston Redevelopment Authority. The project could have been better–we would have especially liked to see more mixed use (i.e. retail) and a more progressive approach to parking–but on balance we supported the proposal because it should revitalize vacant space, benefit the business district, and help with the housing crisis. Earlier this month, the Roslindale Bulletin ran a feature on the BRA approval, quoting our own Matt Lawlor. The full article is reproduced below.